Known as The Horse Capital of the World™, Ocala / Marion County is a top leader in the Equine Industry, having more horses than any other county in the United States. This title, earned by the many large, notable, and historic equine farms, have many Northwest Marion residents wondering how there can be a proposal to run a highway through the very farms that help contribute to our local $2.6 billion dollar equine industry. Economy: Destruction of Historic Equine Farms. Safety: Increase in crime for Marion County by additional highway access from West to East. Land: Direct Impact on Northwest Marion County’s wildlife including federally protected species. Community: Increase in traffic, accidents, and insurance rates for Marion County. Lifestyle: Burden on residents’ peaceful way of life in Northwest Marion County & Equine Communities. FDOT presenting information regarding proposed Coastal Connector study. Residents are encouraged to attend and voice concerns. 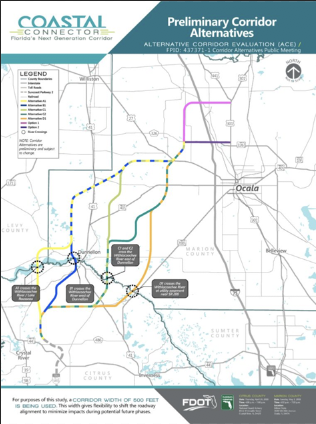 The Coastal Connector sponsored by the FDOT along with Florida’s Turnpike Enterprise is proposing 5 different highway alternatives to connect Toll Road FL589 in Citrus County to highway US301/441 in Marion County. All of the options connect at US 27 in Northwest Marion County just west of CR225A and continue to SR326 eventually connecting to US301/441. Each of the 5 alternatives presented will directly and severely impact some of the biggest equine farms. Coastal Connector held a Corridor Alternatives Public Meeting on May 1, 2018 citing population growth, traffic congestion, truck traffic, tourism, and hurricane evacuation as reasons of need for their Next Generation Corridor. This informational meeting resulted in two groups, No Coastal Connector and Connector Objectors Facebook Group that instantly formed after the meeting and began getting information out there on how to stop this asphalt invasion. Through their efforts the online petition has reached 5,000 signatures. Ocala / Marion County residents and equine authorities alike are voicing their opinion and it is a resounding NO! 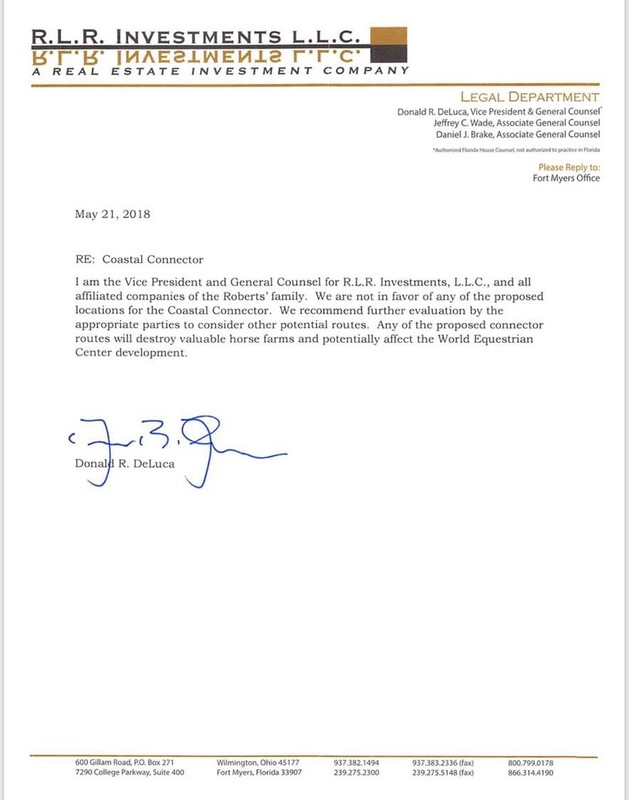 Tammy Gantt of the FTBOA compiled an easy resource guide with all the information needed to contact any official connected to or that has a vote on this project. While officials are touting a 2045 construction completion date, when pressed, some officials are confirming that Marion County could see construction within ten years while FDOT project manager, Bolan recently stressed that they are still in the planning process and that no funding is currently allocated for construction. Ocala / Marion County can say No! Turns out, we were not the first county approached with this Coastal Connector, Alachua and Levy were first approached and they both said, No! We can too. Marion County Commissioner Michelle Stone was quoted in the Ocala Star Banner telling the FDOT at the most recent planning workshop, “My direction to the staff would be these routes cannot be considered at all. Period.” Contact your area representatives to Save Ocala, especially, Governor Rick Scott and let them know you are a proud resident of Ocala / Marion County and you want to continue to live in The Horse Capital of the World. Not sure how you’ll be affected by any of the potential routes? Click here or the photo below to see how the Coastal Connector may factor into your property, neighborhood, or commute.